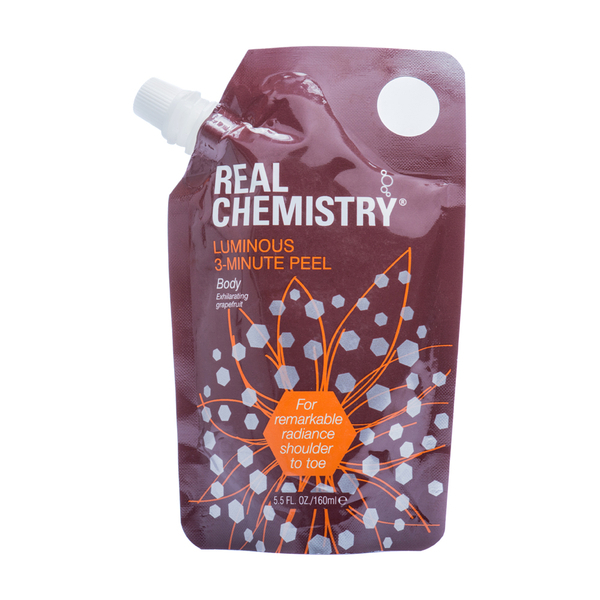 Refine and soften your skin with Real Chemistry Luminous 3 Minute Peel - Body, an exfoliating body peel infused with polishing sand to slough away dead skin. Enriched with hydrating ingredients and an invigorating fragrance, the formula combines with your skin's natural proteins to help lift away surface debris and impurities for skin that is left feeling soft, refreshed and luminous. Its refining properties help to renew dry skin and leave the body soft, supple and radiant from top to bottom. The perfect pre-tan treatment for an even, long-lasting sunless glow. In shower, cleanse skin with a mild cleanser. Pat area dry, but leave slightly damp. It is best to peel one area at a time and a small amount goes a long way. For example, squeeze a small amount of gel from the pouch and spread it thinly over one forearm, upper arm, and shoulder. Quickly begin massaging the area in a circular motion with slightly damp hands. You will feel the polishing sand right away. Continue to massage and the gel peel starts to combine with surface proteins and debris after about 15-20 second so at this stage, you will begin to feel tiny, new solids under the fingertips. 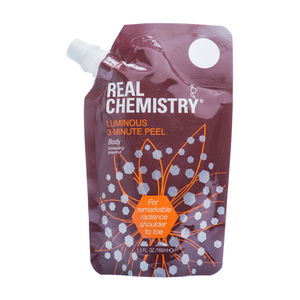 This means the peel is activating correctly and the gel is now combining with your dead skin (proteins). Massage for 2-3 minutes or until all of the gel has combined with dead skin. The peel will look and feel slightly foamy. The polishing sand assists with complete removal of the tiny solids from the surface of the skin for smooth, hydrated, velvety skin. Cleanse area peeled again and go on to the next area to be peeled. Remember to pat dry each area and hands to remove excess moisture. Slightly damp hands and skin produce the best results. After peeling, apply rich moisturiser. Warning: This product is a powerful exfoliant designed to remove dead skin. Do not use on the face or on areas where skin is especially thin and test the product on a small area before use to assess sensitivity. After exfoliating, we strongly recommend applying an effective, physical sun block every day, winter and summer. Product contains soy. Do not use on open, excoriated active acne or other open wounds. If redness or irritation occurs, discontinue use. Carbopol 940, Aqua, Glycerin, Butanediol, Mint Extract, Hyaluronic Acid, Dipropylene Glycol, EDTA Disodium Salt, Glycerin Polyoxyethylene Ether, Alkyl Trimethyl Ammonium Chloride, Essence Of Grapefruit, Hydrogenated Castor Oil(PEG-40), Germal Plus, Wild Soybean Extract, Jojoba Oil, Cosmetic Sand, Lemon Yellow.